And my houseplants have been the battlefield for over a month now! And who am I battling, you ask? I am at war with “The Gnats”! I tried the natural solutions to no avail. Placing sticky cards on top of the soil to catch the flying adults. Letting the soil dry out completely for two weeks, (begging my plants not to wither and die) as this was suppose to kill the eggs. And watering with water mixed with hydrogen peroxide, which is also suppose to kill the eggs. I honestly think this just fertilized the eggs, as we continued to have more and more of them mock us by flying in our face every night! Apparently, our infestation of gnats is beyond these methods. And therefore, desperate times bring desperate measures! 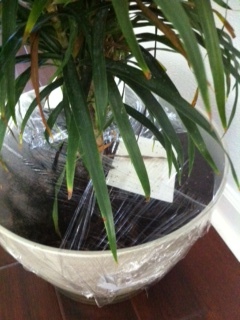 We have wrapped the pots of the houseplants with saran wrap! My mom commented to me that we were going to spend more money trying to kill the gnats than what it would cost to just replace the plants. This is true, due to the fact that we bought the three plants on sale and only have roughly $50 in them. But it’s the principal of the matter! And they are really big and pretty plants. I’m not letting a few 1,000 gnats win this war! Someday, I will be the victor and my plants will be gnat free! Or I will kill my plants in the process! This entry was posted in Random and tagged gnats, home, plants, war. Bookmark the permalink. ← Kitchen Countertops It Is!